Hello,dear all specifically my blogger friends! This is a post only for you.To inform you why I am forced to vanish from your blogs and from indiblogger. Don’t worry, none of the celeb bloggers have their hands in it. 😀 The issue is the internet connection which has made me helpless,limbless,brainless and all in all lifeless. I am unable to see posts of fellow-bloggers that frequently and commenting is a distant dream .I am unable to vote on IndiBlogger for you all as well.All it is somehow allowing is to check comments which have gone down,as expected 🙂 and allowing me to publish posts. Hence , being a doodler, who can never become a Sunny Deol of Gadar and has to look for humour out of worst situations in life, I decided I will better share what I am going through.I want to let you all know,the moment my internet issue is over, you will find me voting for your lovely posts and expressing my views on your blogs . Thanks a ton to the friends who are still around and checking whats on MySay ! For those who might turn up from IndiBlogger to check this -Thank You to you too 🙂 . I am coming !! this is for the first time I am reply so late 🙁 .. its kind of ok now … !! I dont know… how long I will have to go through this phase Sushmitha .. but thanks for dropping by dear friend !! Poetess, wish you would know .. horrible I feel , not being able to read your riddle solving poems on life .. Omg!! Roll on the floor laughing!! 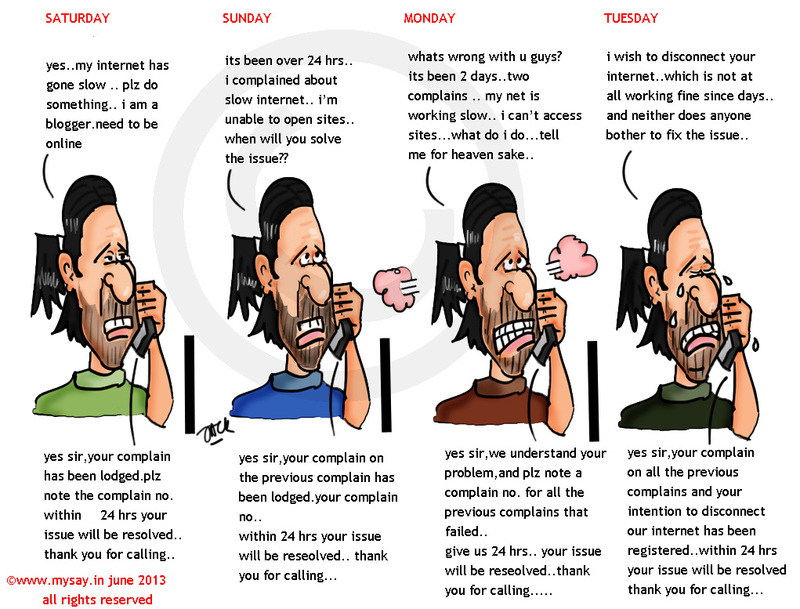 I know how frustrating it is for you but the customer care fellow reply really funny! Nested loop of complaints! Enjoyed this cartoon! I am sure everybody of us have bad experience with these “caring” people atleast once ! We miss you and wish your internet speedy recovery.. Funny! This has DEFINITELY happened to me before..
hahaha!Good one My Say! Your predicament has inspired me to write a short blog on the complaints registration in India. that is great , I will say , Swati !! by raising voice we have or raising eyebrows we need to express our discomfort.Are they robots with programmed command that whatever the customer says register a complain and give a number and move on to next !! i know now how it feels !! Horrible bro..
hehehe .. internet cafe is the only option I got so far 🙂 Thanks for dropping by dear friend !! Anyway, this situation is really annoying. I faced it a few days ago, when I couldn’t come online for 3-4 days. hahaha … i am confused, should i laugh on the doodle and reactions you have potrayed or sypathise you for the internet connection failure … Awesome work on a helpless situation … however i agree that the call center executives tend to not understand our situations most of the times ! Every internet user in India goes through this situation at some point of the time. Welcome to the crowd. 🙂 thanks Manjit for understanding the situation !! .. I absolutely loved your poem .. I often visit your blog and I have always loved your work ! Lol….that’s how things work in our Great Country. lets see when can I get life back !! We are all in a loop. Internet connection takes a lot of bloger s life. I understand your pain. I swear my friend !! its killing me !! thanks for dropping by though and sharing your views . I never felt life this way !! Where Arun..? I am still suffering !! .. I think I am getting 3kbps every sec !! .. 🙁 well..hope things come back to normalcy soon ! You are lucky i must say that you got problem just once in three years, its sort of miracle if you ask the victims of bad internet connections in India. One of my friends have internet connection which disconnects quite often and then takes lot of time to connect back, once she complained that it has not started back from 15 days or so. I can empathize with you. I know how frustrating it is when my online satsangs drop off or I have to cancel them just because the net is down. I prefer staying at a place where there are no such issues. Hope you are able to get a better connection soon. God bless. thanks a ton for dropping by and sharing thoughts !! I am actually managing things somehow .. and waiting for better times when I can communicate properly through fellow bloggers and do not waste 45 mins publishing a single post !! Thank you for the response. My satsangs are mentioned in our website with details of dates and timings on Google hangouts. We are doing Gnosis(Nag hammadi) texts daily and Srimad Bhagvadtam at weekends. This what called as Indian telecom customer service,this may be new to you,you are lucky as you haven’t faced any problem in 3 years.I face problems like this all the time round the year.Wish your internet a speedy recovery.Keep Blogging! It is crazy when the internet is down or the speeds are less. I work from home so that is enough to throw everything out of order for me. true words! !Rachna..no or slow internet puts everything out of place for me too. Hope your problem gets resolved fast. Looking forward to your visit and comments on my posts. The issue raised by you is something of a day to day problem faced by every blogger. The post is unique and is characteristic of the genre you maintain. A great post as usual. Whenever 24 hours time window passes and nothing happens, immediately call or Email Nodal Officer or Appellate Officer. No words would be enough to Thank you Mrinmay for that awesome piece of information .. I felt so helpless all this while ! Thanks for dropping by and sharing the information. Internet connection going down is an issue we all hate! I am sure the internet service providers would’ve read ur post! Gud to see u find humour in all situation!!! thanks Shahen. its all about perception.. choice is ours.. always 🙂 I prefer to smiling at problems when I know solution may take time ..